As featured in The Sun! FANCY your own Homes Under The Hammer project? It might only cost you £15,000 in Doncaster. A terraced house on the outskirts of the South Yorks city is up for auction with an ultra-low guide price - but you might see why it's so cheap when you take a look inside. On paper, the house - which is listed on Rightmove - is a good-size property with four bedrooms, two reception rooms, two bathrooms and a garden. But four-bed houses don't come this cheap without a catch. The home is full of rubbish and looks like a "war zone" inside, said auctioneer James Vandenbrook, of Regional Property Auctioneers, who is selling off the property. The house was previously owned by "a bit of a hoarder," Mr Vandenbrook added, and it's been empty for about two years - so it will need a complete renovation, including a new kitchen and bathrooms. Restoring it could cost anywhere between £20k and £50k, experts told The Sun. "It needs a lot of work doing to it," Mr Vandenbrook said. "But it's been really popular this lot. "We've got 40 to 50 punters on this one. I'm expecting there to be a full [auction] room and to get a good price." Mr Vandenbrook says he expects the property to actually sell for about £30k. Similar sized properties on the same street have sold for £80,000 recently, so a renovator could make as much as £30,000 if it sold for £30,000 and renovating it cost the lowest estimate of £20,000. 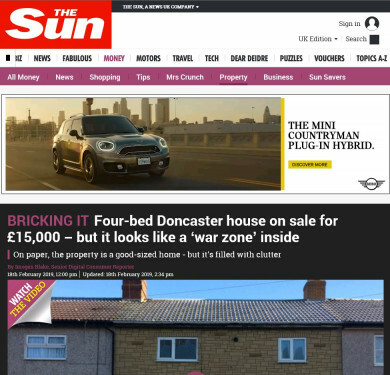 Meanwhile, independent property expert Henry Pryor told The Sun he expects it to sell for up to £25k. Mr Pryor added: "I expect the biggest individual cost will be clearing out the house which, from the photographs, looks like it would embarrass The Lady in The Van." He added: "Someone buying this property is going to put in a new kitchen, bathrooms, re-plumb and re-decorate before then asking Alan Titchmarsh to come in and do the garden." "While the pre-auction guide is just £15,000, I expect that the auctioneers will do better on the day," he continued. "As regular viewers of Homes Under the Hammer know, the guide is often a tease and with excitement and enthusiasm on the day properties often make more." The house will be auctioned off on Wednesday at the Doncaster Rovers Football Club at 2pm if you're interested. Copyright ©2019 Regional Property Auctioneers. All rights reserved.